At Granite Bay Speech, we provide our clients with the most advanced technology in speech therapy! The SmartPalate System shows the students exactly where their tongue is supposed to touch their palate when producing different speech sounds. 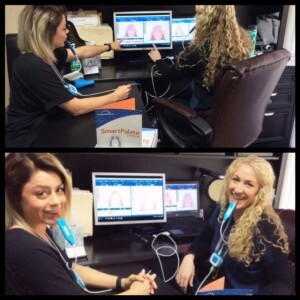 This biofeedback system consists of a customized acrylic mouthpiece with sensors that capture tongue-to-palate contact (the SmartPalate) and a software program. Immediate feedback is provided to all users matching their tongue placement to the articulation patterns for their target sounds. These “tongue targets” allow speech therapy students to quickly produce sounds they have previously struggled with by simply positioning their tongue to light up the corresponding contact points for that sound. The SmartPalate assists the student to repeat sounds accurately time and time again with instant feedback that empowers the students to make even the most fine-tune adjustments on their own. The SmartPalate quickly corrects articulation errors where the tongue makes contact with the roof of the mouth. These sounds include the most commonly treated sounds: /r, s, l, sh, ch, k/ and among others. The SmartPalate technology has been successfully used with many populations including individuals with oral motor disorders, phonological disorders, cleft palate, Down syndrome, Apraxia, Dysarthria, and speech disorders caused by stroke or traumatic brain injuries. Contact us for more information at 916.797.3307 or info@granitebayspeech.com. Tired of seeing your child get frustrated when trying to spell? The “Spell Better” app is designed to help reluctant and struggling spellers get started on their journey of story telling and writing. Over time the app will not only help improve your child’s confidence, but also will improve communication skills, grammar and spelling. The app offers a dyslexic and phonetic spell checker. It includes an option for word prediction as well as auto completion. There is even an integrated English dictionary, word highlighting and text-to speech capabilities. If that isn’t enough, Spell Better also allows the user to insert picture and rich text formatting. Spell Better is FREE TO TRY! You can explore all core features including the word prediction, spell correction, and even text-to-speech in the free version. However, you need to upgrade in order to export your documents from Spell Better and to create new notes and save or delete older ones. Ability to create new notes (a “+” button will appear at the top right). If you have any speech, language, learning, communication or dyslexia related question, please feel free to contact us. 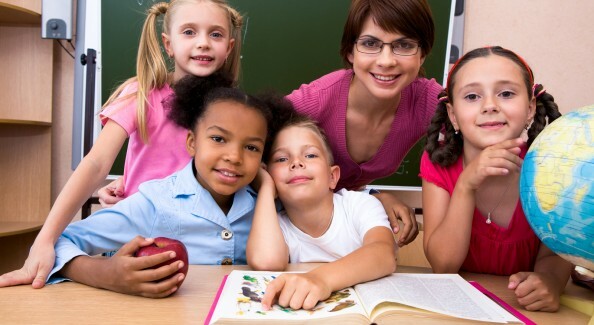 Kinder Common Core standards encompass the development of receptive and expressive language. It looks at basic oral communication skills, such as, forming a complete sentence to share information and ideas clearly. Students describe people, places, things, and events. The CCSS focus on peer-to-peer conversations with multiple exchanges through asking and answering. They need to know social rules, such as listening to others and taking turns speaking. Students in kindergarten are expected to identify and sort common words into basic categories (e.g., colors, shapes, foods). Students also use both general and specific language to describe events and common objects, which they do in both speaking and writing. They are required to understand one- and two-step oral directions and carry out the directions. By the time your child is ready to begin kindergarten, he should be able to recite the alphabet with few problems and be able to recognize letters independently. These skills make up the foundation of reading and writing, and are emphasized heavily in most curricula. Tips: Read to your child at least 30 minutes a day. Make learning fun by marching around the house singing the alphabet or find items around the house that begin with each letter. Having a basic understanding of shapes and colors is one of the primary building blocks of cognitive development. Tips: Label common household items by its shape, color, or both. You can also have your little one help you sort laundry by color. If your child has never attended daycare, was not enrolled in a center-based group preschool, and doesn’t have siblings, he may not interact with other kids enough to gain the social skills he’ll need to navigate kindergarten. Helping your child to understand about behavior, manners and the importance of being nice is an essential task. Tips: Playing board games help your kiddo understand turn taking, sharing, and/or following directions. You can refer to our 5-Year Checklist as a guide on what your child should be doing. Contact us for a consultation or evaluation. With Kindergarten sign-ups fast approaching, you want to be sure your child is ready!